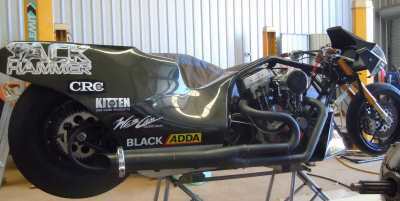 Australian Multiple Top Fuel Motorcycle Champion Chris Matheson has taken out the first round of the Australian National Drag Racing Championship at Kwinana Perth Motorplex. Matheson said he had inspiration from English land and water speed record holder Donald Campbell, who celebrated a 50 year anniversary at nearby Dumbleyung, some three hours east of Perth. On route from Brisbane to Perth to compete in the Nitro Slam, Matheson and Crew Chief Graeme Turner visited Campbell’s scene of the record run and soaked up the atmosphere of the incredible achievement all those years ago on 31 December 1964. Donald Campbell, some fifty years ago was the first person to set land and water speed records in the same year. 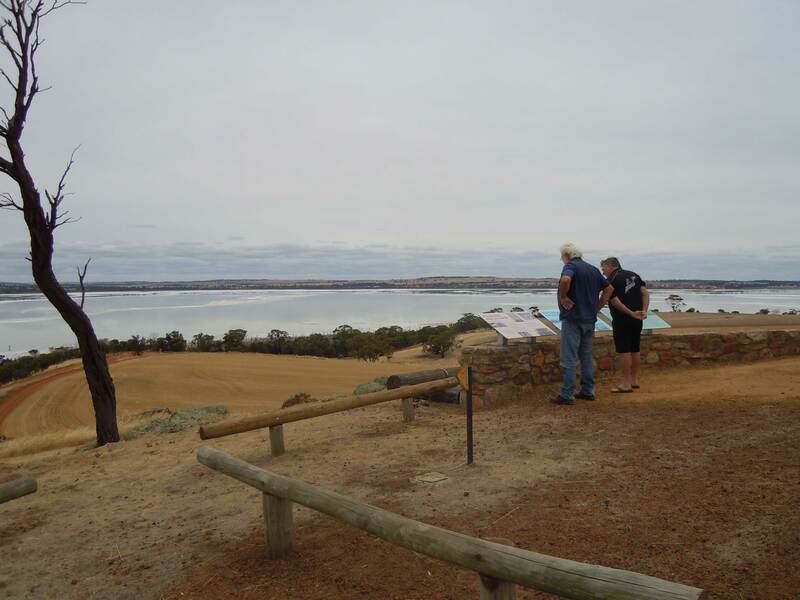 Matheson said “visiting Campbell’s monument overlooking the lake was very moving, it’s incredible to see what was achieved all those years ago, with sheer brute horsepower and unstoppable determination – wow, what hero’s those guys were. 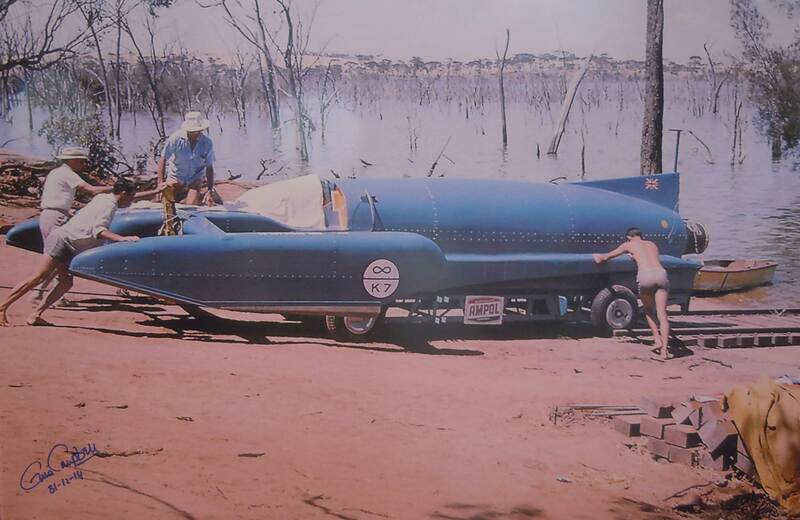 I recall as a very young boy, my father giving me a model Bluebird to play with, when Donald Campbell set the land speed record at Lake Eyre, South Australia, reaching 648.72 kph (July 1964) in the Bluebird CN7. I still have the model all these years later. The visit to the lake was a great day and one I will not for forget, it bought back fond memories as a child and inspiration to race the following weekend”. Nitro Slam saw a huge field of 13 Nitro Bikes, all vying for the 8 bike field. Matheson said it was a competitive field of bikes, all regulars to the track, with only two interstate competitors making the 5,000 klm journey across Australia. We knew we were the underdogs and as one media journalist describes us as “unlikely winners”. Despite that, we qualified number two and crept up on top qualifier and current Champion Mark Drew, as we approached the final round. We had a good run through the eliminations, despite the cross winds at approximately three quarter track. Matheson said he had to peddle the Jack Hammer on a couple of occasions, which is not ideal. These Twin Cylinder motors don’t like an “on/off” throttle in the run, they tend to grenade, but Crew Chief Graeme Turner had the set up down pat. Matheson said “we ran relatively soft all weekend, then put a little more in for the final to try to get the job done. The bikes virtually ran side by side, until Matheson got out of shape, shutting down before the finish line, only to see Drew cross the center line and being disqualified, we saw a win light at 6.44 at 218 mph. Matheson went on to say “it was a great result. My Team Graeme Turner and Clint Ackland really made the turn arounds and the whole meeting enjoyable. We had plenty of time to talk to the fans and enjoyed the entire atmosphere. Focus now turns to a double round at Perth Motorplex in 6 weeks’ time and I’m looking forward to racing the WA guys on their own turf again. WebCam, GT Radiators & Machining, Rocket Industries, CRC Industries, PDS Graphics, Kitten Car Care Products, BlackAdda, Hi-Side Leathers, Boninfante Friction Inc. Special thanks to Doug Vancil, Steve and Larry McBride.